Transfer oil, gas, water, anti-freeze and more quickly, easily and without making a mess! Battery-operated liquid transfer pump is perfect for everything from draining aquariums and siphoning gas to pumping water out of your boat and replacing vehicle fluids! Now you don't have to jerry rig a siphon to transfer liquids. 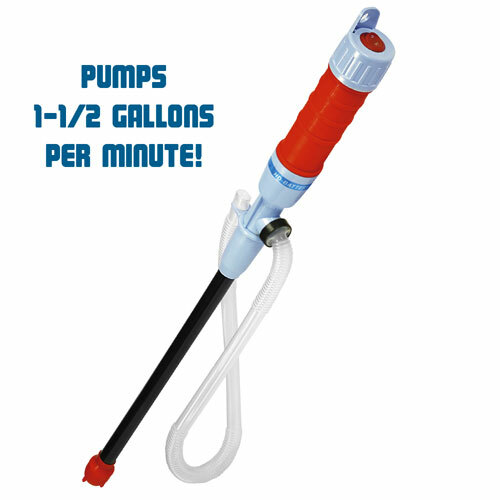 This pump gets the job done at the touch of a button! It pumps up to 1-1/2 gallons per minute with virtually no effort. Plus, its special design makes spills a thing of the past - no messes to clean! 2 'D' batteries (not included). Model may vary. Perfect for winterizing cars and boats, preparing snowmobiles and ATVs for storage, keeping your aquarium clean and more!